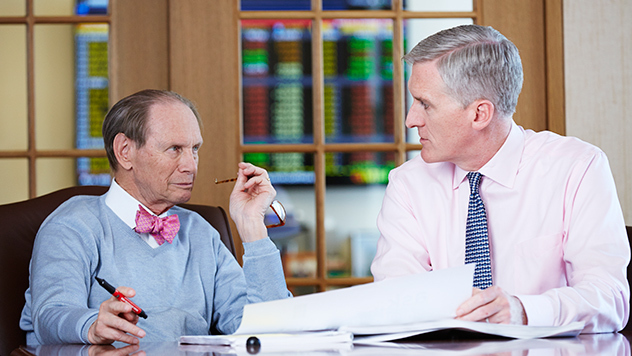 Portfolio Manager Chuck Royce and Co-CIO Francis Gannon review 1Q18 and detail why they still favor profitable small-cap cyclicals with global exposure. Why do you think the global equity markets are only now seeing increased levels of volatility after a long period when it was low? Chuck Royce We can look at rising rates as well as tariffs and trade wars, but I think trying to identify the sources of increased volatility risks obscuring what’s most important—which is that the long bull market has been the outlier in terms of low volatility. From a historical perspective, the post-Financial Crisis period has been really placid, and for that reason far from typical in terms of volatility levels. Previous bull markets saw much more frequent market movements than what we’ve experienced over most of the last nine years, especially in 2016-2017. In fact, 2018’s first quarter—as wild as it felt—was actually less volatile for small-cap than its historical average. 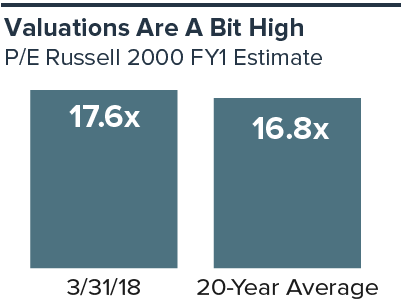 The CBOE Russell 2000 Volatility Index (RVX) measures market expectations of near-term volatility conveyed by Russell 2000 stock index option prices. I see increased volatility as another component of the gradually normalizing environment that’s been slowly materializing over the last couple of years. For most of my career, volatility has been part of the daily reality of equity investing, and the first quarter certainly gave investors a powerful reminder of that reality. But we’ve always seen volatility as a positive long-term force—it’s not a synonym for risk, it’s a synonym for opportunity. Would you say the market is in a transitional mode, then? Francis Gannon I think what we’re seeing with regard to increased volatility definitely marks a transition. By fits and starts, the market is shifting as investors try to adjust to accelerating global growth, rising rates, and the possibility of inflation after emerging a few years ago from a period marked by anemic growth, near-zero interest rates, and the threat of deflation. Investors seem unsure about how long the currently improved conditions are going to last, so they’re sticking with what’s been working most recently, be it passive vehicles or the more growth-oriented environs of tech and healthcare. We’re not sure when these constricted preferences will shift, but we’re confident that they will. 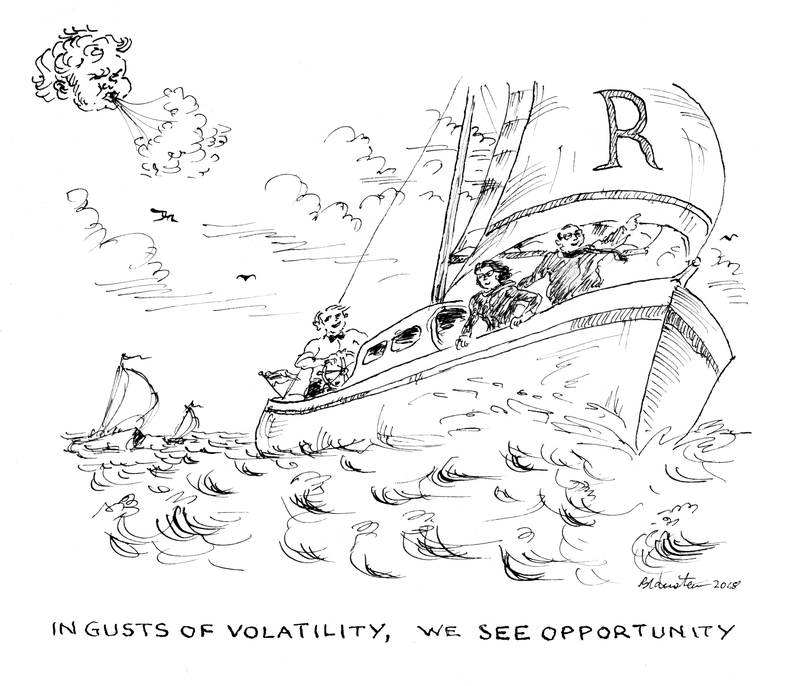 What kind of opportunities has recent volatility created in your portfolios? CR We’re seeing a lot of discreet opportunities across several industries, which is consistent with a period of increased volatility following a strong up market phase. Many of my most recent purchases have been low-multiple stocks—which is where I think the best combination of attractive valuation, low expectations, and long-term prospects can currently be found. It’s primarily been on a stock-by-stock basis, including companies in finance, real estate, chemicals, and energy—generally the areas that have been hit hardest so far in 2018 and/or that didn’t participate in 2017. Throughout the first quarter, we tried to use the volatility to our advantage by building or initiating positions at prices that we liked when shares were falling. Are you still confident that small-cap cyclicals can re-take leadership within the asset class? FG I’m increasingly convinced that investors who are uncertain about the sustainability of the global economic recovery are creating the bulk of the market’s volatility. 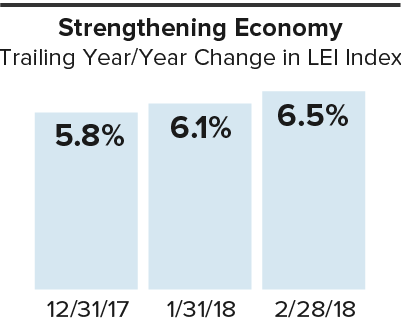 Yet the longer economic growth remains strong and earnings in select companies continue to improve—or in some cases, recover—the more likely we think it is that the benefits will accrue to more cyclical companies. Our own research shows that those areas continue to enjoy some of the strongest earnings prospects. ­LEI Index is an index of Leading Economic Indicators including economic variables that tend to move before changes in the overall economy. These indicators give a sense of the future state of an economy. So you think the ongoing acceleration of the global economy should help more cyclical businesses? CR We do. First, we saw marked leadership from cyclical sectors in 2016. 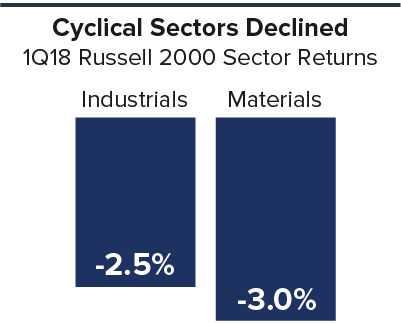 What many people missed, or perhaps forget, about 2017 was that many of these same cyclical areas were strong performers during that year as well, particularly Industrials, Materials, and the more cyclical technology industries such as semiconductors. They were outpaced—and thus overshadowed, I think—by a significant rebound for the bio-pharma complex, but otherwise they did very well. Our thought is that this sort of irregular, somewhat lumpy leadership and performance pattern could linger for a while, but the larger forces that are in play look likely to be with us even longer—and they favor cyclical leadership. So we think the expectation that growth stocks will keep leading is too high and that expectations for cyclicals are too low. What are these forces that underlie your optimism about cyclicals? FG We currently have a global backdrop that could not be more favorable for cyclical businesses—economies are expanding, rates are rising, and earnings growth is robust. Leading economic indicators are still very positive and manufacturing and industrial activity remains vibrant. It may sound strange, but all we need is for more investors to understand this and act accordingly. Without trying to sound overdramatic, you can argue that by sticking with growth stocks, investors are defying or ignoring reality. At the very least, many don’t seem to be paying attention to the companies and industries where we see some of the strongest prospects for earnings growth. Does this help to explain why 1Q18 was another strong quarter for the Russell 2000 Growth Index? FG I think it does. Small-cap growth has shown remarkable resilience over most of the last several years. However, its leadership has been very narrow, driven mostly by the same handful of industries within technology and healthcare. It’s odd that such narrow leadership resumed in the first quarter during a period of strong economic growth. But there’s no question that the success of small-cap growth has created a narrower band of high-returning small-caps in 2015, 2017, and in the first quarter of 2018. Which do you think is a greater concern for small-cap investors—rising rates or inflation? CR I don’t see either as a major concern for small-cap investors. I think a lot of the anxiety in the talk about both rising rates and inflation misses some very important points. First, rising rates are healthy in the context of where rates have spent most of the last decade. Increases, which have so far been slow and incremental, are another element in the gradual normalization of the economy and capital markets. Since the Fed first began to raise rates, we’ve seen it as a sign that the economy is strong. We have a similar view of inflation—in a growing economy, there should be some inflation. So the real issue is not rising rates or inflation per se, but the anticipated rate of change. If each climbs at a more expected pace, then I don’t see either as likely to significantly slow or reverse moderate advances for equities. If one or the other rises quickly and unexpectedly, then it becomes an issue. But in that case we’d be talking about a shock to the system—which is very different from what we’re seeing now with both rates and inflation. The real issue is not rising rates or inflation per se, but the anticipated rate of change. If each climbs at a more expected pace, then I don’t see either as likely to significantly slow or reverse moderate advances for equities. How has the likelihood of tariffs affected your view of the prospects for small-cap stocks, specifically industrial stocks? CR Over the long run, I expect cooler heads to prevail with some kind of arrangement that works, particularly among the U.S., China, Europe, and Japan. But tariffs and trade wars are undoubtedly a destabilizing force, as we saw in late March and early April when stocks dropped precipitously. Markets crave some degree of certainty, and anything that creates less is an obvious negative. To take just one example, tariff supporters don’t seem to have fully thought through that industrial metals users are as important as sellers. There are businesses that look like they may take a significant hit. That kind of concern is not great for stocks. Being long-term investors, however, we still like cyclicals with global exposure. During the first quarter, small-caps with greater global exposure again beat those companies in the Russell 2000 that have no foreign sales (as they did 2017). Companies in the small-cap index with foreign sales of 30% or higher rose 1.7% in 1Q18, versus a loss of 1.5% for those with no foreign sales and a decline of 0.1% for the Russell 2000 overall. What have you been hearing from management about their CapEx plans? CR We’ve heard encouraging words from a number of management teams. Most of our conversations have focused on spending on new technology, automation, and related improvements as opposed to, say, building new plants. What’s interesting to us, though, is that many of the companies we’ve talked to that are ramping up CapEx spending have been motivated more by the improving economy than the reduction in tax rates. Regardless of the reason, however, we’re pleased to hear that companies are preparing to spend more following a prolonged period of subdued CapEx spending. The FY1 P/E is the current price divided by the average of the estimated forward looking 1-year earnings per share (”EPS”) provided by brokerage analysts. Estimated EPS uses the average of the analysts’ estimated earnings provided by brokerage analysts who cover each individual security as reported by FactSet. How would you describe the current state of small-cap valuations? FG If you look at the Russell 2000, valuations are still a bit on the high side. But given the wide diversity within the small-cap universe, we think it’s important to remember that the index does not always paint an accurate picture of the state of valuations. In order to discover that, you need to look at companies or industries. Many of those low multiple companies that Chuck mentioned, for example, are sporting what we think are attractive prices. You can also get a sense of the diversity of valuations among individual companies by comparing the cap-weighted return of the Russell 2000 in 1Q18 with the equal-weighted return—which was -2.5% versus -0.1% for the quarter. 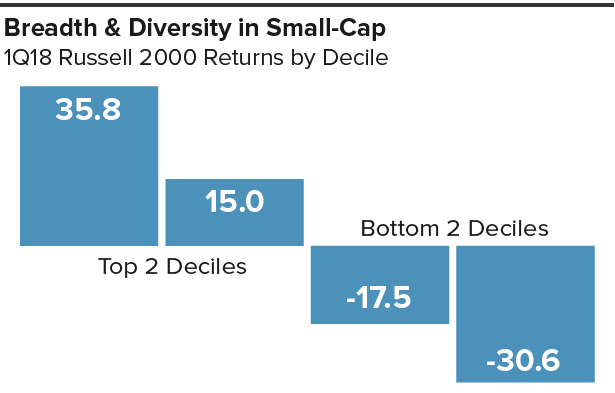 CR The breadth and diversity in small-cap are very important to active management. For example, the top two deciles of the Russell 2000 were up 35.8% and 15.0% in the first quarter, while the bottom two were down 30.6% and 17.5%. This considerable dispersion means that we can always find what we think are promising long-term opportunities. Do you still expect small-cap returns to be lower going forward? FG For the Russell 2000 we do. 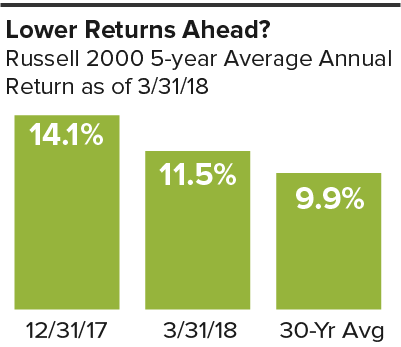 After rising for three consecutive quarters, the five-year average annual return for the Russell 2000 as of March 31, 2018 was 11.5%—compared to 14.1% at the end of last year. That five-year return from the end of March was much closer to the five-year monthly rolling average for the small-cap index over the last 30 years, which was 9.9% as of March 31, 2018. CR We see lower index returns—let’s say in the high single digits—as part of the road back to more historically typical economic and market patterns. These lower-returns periods have historically been favorable for active management approaches, especially those with valuation-sensitive strategies. So we see ample opportunity for disciplined stock pickers to outperform in this kind of environment. Would you describe your long-term outlook as optimistic, then? FG Our long-term view remains cautiously optimistic. In addition to lower overall returns for stocks, we expect that leadership will come from small-caps in economically sensitive industries that blend profitability, relatively attractive valuation, and global exposure. All indexes referenced are unmanaged and capitalization-weighted. Frank Russell Company (“Russell”) is the source and owner of the trademarks, service marks and copyrights related to the Russell Indexes. Russell® is a trademark of Frank Russell Company. Neither Russell nor its licensors accept any liability for any errors or omissions in the Russell Indexes and / or Russell ratings or underlying data and no party may rely on any Russell Indexes and / or Russell ratings and / or underlying data contained in this communication. No further distribution of Russell Data is permitted without Russell’s express written consent. Russell does not promote, sponsor or endorse the content of this communication. The Russell 2000 Index is an index of domestic small-cap stocks that measures the performance of the 2,000 smallest publicly traded U.S. companies in the Russell 3000 Index. The Russell 2000 Value and Growth indexes consist of the respective value and growth stocks within the Russell 2000 as determined by Russell Investments. The performance of an index does not represent exactly any particular investment, as you cannot invest directly in an index. Sector weightings are determined using the Global Industry Classification Standard ("GICS"). GICS was developed by, and is the exclusive property of, Standard & Poor's Financial Services LLC ("S&P") and MSCI Inc. ("MSCI"). GICS is the trademark of S&P and MSCI. "Global Industry Classification Standard (GICS)" and "GICS Direct" are service marks of S&P and MSCI.